Ritzbury powered 86th Sir John Tarbet Senior Athletics Championship at the Mahinda Rajapaksa Stadium in Diyagama, Homagama yesterday. 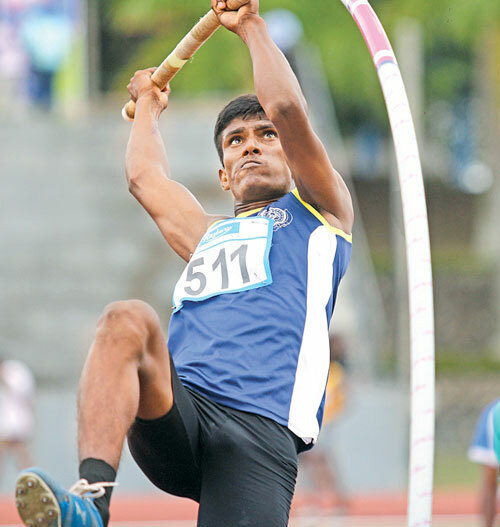 The first record was set up by Arunodaya College, Jaffna’s Napthali Jason who cleared 4.56 metres in the Under-18 Boys Pole Vault final which was followed by the new meet record for the Boys Under-20 Discus Throw final with Malinda Madushanka of St Rita’s College, Thaldeka throwing a distance of 42.72 metres. The third new meet record for the day was established by Richmond College Galle’s Irusha Malinda, who leapt 7.17 metres in the Boys Under-18 Long Jump final. The final meet record was created by Ushan Thiwanka of Maris Stella College, Negombo in the Boys Under-20 High Jump final when he cleared 2.17 metres. Rahula College, Matara equalled the 4x100m relay record when they won the event in a time of 42.5 seconds. Several final events are scheduled for today, the second day of the three-day meet organized by the Sri Lanka Schools Athletics Association and sponsored by Ritzbury, main sponsors for the fifth consecutive year. Under-20 4x100m: Trinity College, Kandy 42.8 secs. Under-20 High Jump: Ushan Th wanka (Maris Stella College, Negombo) 2.17 metres and RR Dhammika (Kularatne) 2.10 metres. Under-20 Long Jump: Nipun Kaldera (Loyolla College, Daluwakotuwa) 7.38 metres and PG Dhananjaya (S Joseph Vaz College, Wennappuwa) 7.16 metres. Under-18 Long Jump: Ishan Dimuthu (Richmond College, Galle) 7.03 metres and Shehan Visanperuma (Lyceum International College, Wattala) 6.96 metres. Under-16 Triple Jump: Lasaru Prabodana (Maris Stella College, Negombo) 13.44 metres, Sandun Krishantha (Krillawala CC) 13.11 metres and Dillon Ludowyke (St Joseph’s College, Colombo 10) 13.05 metres. Wennappuwa) 12.99 metres and TT Thanthirimalage (Maliyadeva BV, Kurunegala) 11.69 metres. Under-18 High Jump: Randi Himasha Cooray (Gateway International College, Rajagiriya) 1.64 metres.